One morning, a few weeks ago, we went outside and sat at our new picnic table. At that time, it was under a tree. It was a nice location since the tree provided shade against the tropical sun. However, that morning we noticed a number of caterpillars (chenilles) all over the table. We brushed them off and sat down at the table. Then a caterpillar fell from the tree and landed near Eila. Hrm. 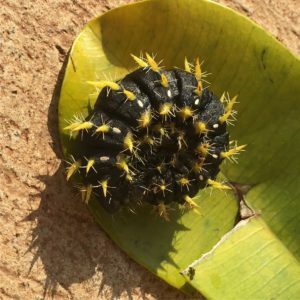 And these just weren’t any little caterpillars, these were large (2-3 inch) black ones with yellow spikes. 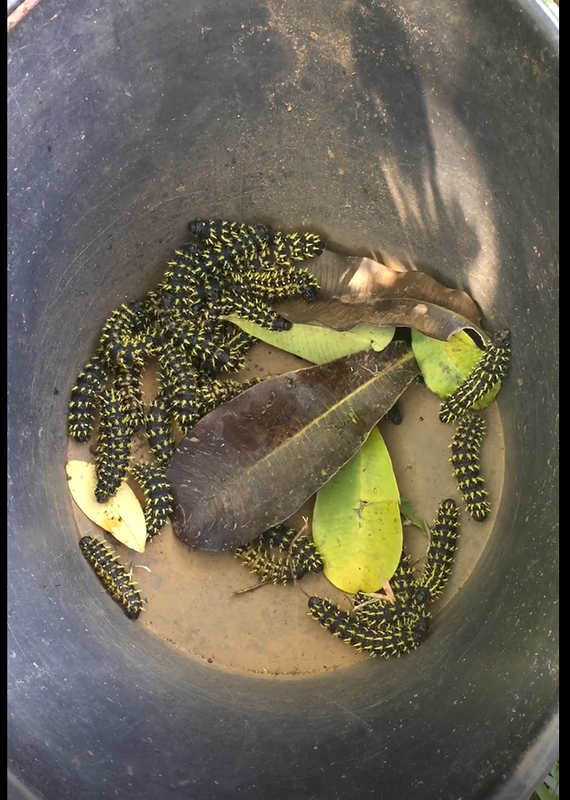 We started to move them into a bucket we had around. Remembering that I’ve seen similar caterpillars live in the open air markets here in Cameroon, I brought the few we had collected to the guard at our compound and asked if he would want them. “Well, yes, but there’d have to be more”, he said to us (in French) — but he would stop by at the end of his shift and pick up what we had. So we went back and noticed that more had fallen from the tree above. We scooped those up into the bucket. Soon, every time we went by there were more caterpillars to be collected and by the end of the morning, we had quite a number writhing in the bottom of our bucket. We ended up with more than this. At the end of the day, the guard stopped by and we gave what we had in the bucket to the guard in a baggie. The next day we asked him how they were , and he said they were very delicious. His son knew how to prepare them, and they are them with tomato, garlic, and lots and lots of piment (hot sauce). We’re glad someone could use them.